Whether you are looking for a replacement or new porch we are able to meet your requirements, including digging the foundations, forming the base, building walls, erecting the frame and roof and fitting the glass. We will even plaster and lay the flooring. 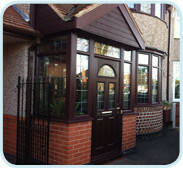 Porch and roof designs are bespoke and available as a hipped, gable end, lean to or flat roof option. For design ideas view our downloadable brochure. 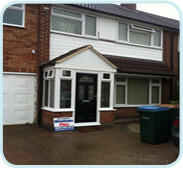 We install GRP canopies for over a front or rear door. 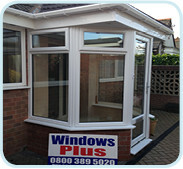 They are a single piece GRP unit giving the impression of a solid roof. These are ideal for providing shelter from the weather for your visitors. With a comprehensive range of porches and canopies to choose from, alongside a range of colours, we can offer you some of the finest work money can buy. 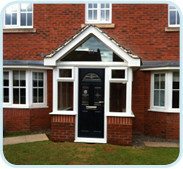 We are offering this bespoke product to the residents of Coventry, Nuneaton, Rugby and the surrounding areas. So if you live in our serving area give us a call or visit our local showrooms in Coventry, Nuneaton and Rugby. Our addresses can be found on our contact page.